Maricopa County Superior Court Judge Bruce R. Cohen on Jan. 11 released his ruling in favor of a Motion to Dismiss filed by attorneys representing a medical marijuana dispensary planned for 1616 E. Glendale Ave. However, the fight might not be over just yet. 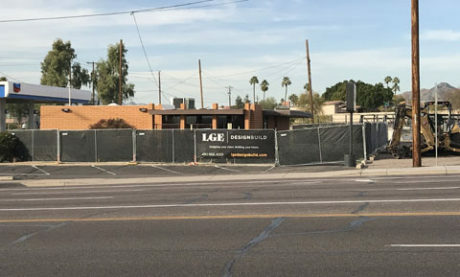 A lawsuit was filed by two residential neighbors adjacent to the site after the Phoenix Board of Adjust overturned an earlier decision by a city zoning administrator to deny the necessary use permit and variances needed for the dispensary to operate. The Board of Adjustment’s ruling on April 5, 2018 effectively gave 64 Alpha LLC and its partners, including building owner Mitchell Song, DVM, the go-ahead for the dispensary. While the neighbors asked the Board of Adjustment to reconsider its decision at its next regular meeting on May 3, and it was on the board’s agenda for that date, the board declined to review the matter, and no action was taken. The judge ruled that the 30-day timeline for filing a lawsuit began from the date of the initial decision by the Board of Adjustment. However, the neighbors’ case was not filed in Maricopa County Superior Court until May 31. In his conclusion, Cohen stated that “This court is time barred from considering the special action,” and therefore the complaint was dismissed. Cohen based his decision on a 2018 ruling by the Arizona Supreme Court related to local governments’ own regulations regarding appeals made in a timely manner, and the failure of appeals to be made in those time limits preventing the appellate court from being able to take jurisdiction. Joshua Carden, P.C., the attorney for the plaintiffs, pointed out that the Board of Adjustment meets only once a month, and had his clients first filed the special action in court prior to the group’s next meeting, it would have effectively taken away jurisdiction from the board, meaning the members could legally not take any action on the case if there was a court case pending. By narrowly interpreting the “time limit” imposed by city ordinance for filing a special action with the court, the Supreme Court’s interpretation of the 2018 ruling could possibility eliminate a local government body’s ability to make a reconsideration of its own previous decision. “The judge’s ruling unwittingly kills an entire section of Phoenix city ordinance by following this Supreme Court decision,” Carden pointed out. Carden’s clients had until Jan. 29 to file a motion for a new trial, and until Feb. 13 to file an appeal of the judge’s ruling. No decision had been made as of press time. Officials from the proposed dispensary didn’t want to comment until the appeal period for the judge’s ruling had passed. Mitchell Song has owned the building since April 2003. The 1,618-square-foot structure was constructed in 1964 and Song previously operated his animal dermatology clinic there.